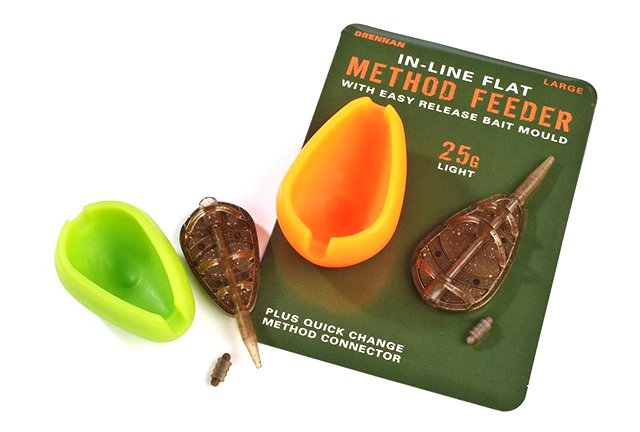 With this improved design of Drennan In-Line Flat Method Feeder, both the lead in the flat base and the bait load distribute the weight into an aerodynamic bomb shape. The shape of the feeder increases casting distance and improves accuracy, particularly in strong cross-winds. On the body of the feeder, the two largest bait-holding ribs are well spaced and curved away from each other. This leaves a generous gap so that the hook bait can be placed in the optimum position. This area also aligns with a recess in a Drennan bait mould for perfect positioning every time. Used in conjunction with the non-stick, easy release bait mould, you can achieve perfectly shaped groundbait and/or pellet mouldings every time. A special slim-line loop-to-loop Method Connector bead, also provided, allows you to swap feeders as well as quickly change the hook link in seconds. A more recent introduction has been the Heavyweight sizes; 35g to fit the green mould and 45g to fit the larger orange mould. These are ideal for long-range casts, casting into headwinds and offer even more purchase on a steep slope. Sometimes we are able to launch products that are better designed, a better quality of build and better value for money than the alternatives!